Abstract: In addition to the old standard IDE RAID we find 5.1 audio (software codec), 10/100 NIC, IEEE 1394, USB 2.0, three DIMM slots and AGP 8X. 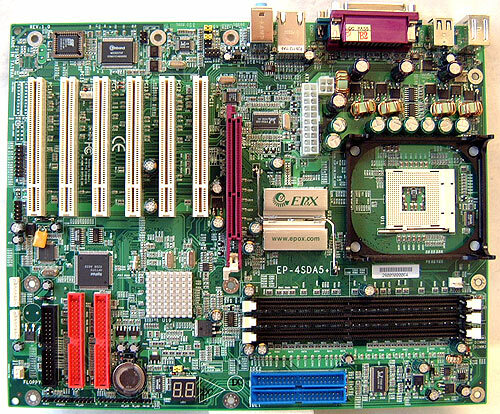 I've been a big fan of Epox motherboards for a long time now, and when I heard that they were producing a SiS 648 based motherboard, I was very interested to see how it would really perform. The SiS 648 chipset is generally know as a good performer in most situations, sometimes even rivalling Intel's DDR chipsets. Unfortunately, most of the SiS boards we have tested have proven to be rather poor overclockers. If any manufacturer can make a good overclocking SiS 648 based motherboard, it's Epox. Right? Realistically speaking, Epox are not bewildered by the mention of "overclocking" - the actual number of consumers who partake in this sport are small. The real market motherboard makers need to supply are consumers like you and me - people who just need a board with a good feature set, and reliable performance. In this regard the 4SDA5+ should turn a few heads with the sheer variety of on board features. In addition to the old standard IDE RAID we find 5.1 audio (software codec), 10/100 NIC, IEEE 1394, USB 2.0, three DIMM slots which support up to 3GB of PC1600/2100/2700/3200* (* - unofficial PC3200 support), 8x AGP and six PCI slots! The layout of the 4SDA5+ is pretty good. The IDE Connectors are in a very good location just to the right of the DIMM slots where they won't be in the way. While the ATX power connector and the P4 connector are to the right of the CPU socket, it doesn't really bother me because this gives the MOSFET's the most steady power and electricity. As you probably noticed, Epox puts a passive heatsink on the SiS 963 heatsink. At first I thought this was a cosmetic move, but during testing the heatsink did get quite toasty! Either way it's great for piece of mind.